How will emerging technologies impact and enhance your home & business security for the future? 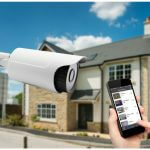 In recent years there have been massive changes in the security sector for private and domestic home use. We sometimes hear the chatter: demands to continuously improve cost, schedule, safety and quality – but what does it really mean for day to day living? CCTV systems cameras serving as deterrents are probably one of their most recognised benefits. We are certainly emphasizing this particular feature the most. Just like seeing multiple alarm systems, an intruder seeing cameras may decide that it’s easier and safer to move elsewhere. It’s much better to prevent intrusion than dealing with it after it has occurred. By deterring criminal activity, CCTV security systems can reduce your home and property insurance costs. You are less of a target, so the risk is lowered, which means the price of your insurance can decrease too. If you’re the victim of burglary and your home isn’t properly secured, you may find that your home insurance provider could question your claim and refuse to reimburse you. As well as being less of a target, CCTV offers evidence towards insurance claims that you may not have had otherwise. The more evidence you have to support your claim, the better, proving beyond doubt the circumstances surrounding your claim. And if you are a newcomer and didn`t see much of the neighbourhood or a member of an expat community in Ireland, you can feel much safer knowing that all your property is safe and secured. CTS CCTV Systems Wexford is fully capable of providing a system that is right for you, whether it’s a simple alarm or the latest CCTV technology. CTS Systems IT specialists Wexford have an experienced security systems installation team that will work with you and around your schedule to arrange a convenient time to have our installers come out and set up your security system. Protecting your home or business isn’t as complicated or expensive as you may think. Modern security systems aren’t just for big businesses. A modest initial outlay will buy a set up tailored to your requirements, help to protect people, and prevent costly theft or damage. The technology is easy to understand, simple to use, and cost effective to maintain. And while thinking ahead now will save you a lot of money and stress in the long run. The security camera kits include everything you need to install the cameras, including a wireless link back to your house or office. There is no special technical skills required to install the system but if you are more comfortable, our team will install the system professionally and actually show you on how to use it on the day of installation. The system is completely flexible and we can add more cameras to extend the wireless to extra buildings at any time in the future. What are the main pros for installing a CCTV SYSTEM? Running wires is most often not an option. Trends in low-power electronics and high-bandwidth wireless communications will continue to have a huge impact by being able to bring the digital tools directly onto the site. Automated site monitoring is a systems-level approach to weaving together many of these technologies into the “nervous system” of the modern farmhouse. The automated site monitoring system is aimed at reducing costs, improving safety, managing schedules and improving quality.